A blood glucose meter is a computerized device used to measure one’s blood glucose levels. It is small in size, and it provides both you and your doctor with valuable information about how your exercise, food, stress, medication, and other factors are affecting your blood glucose. Your doctor and you can use this information to create a constructive treatment plan. Choosing the right monitor for your own personal needs can be a daunting task, especially if you are new to testing. The following information should help you narrow down your options. 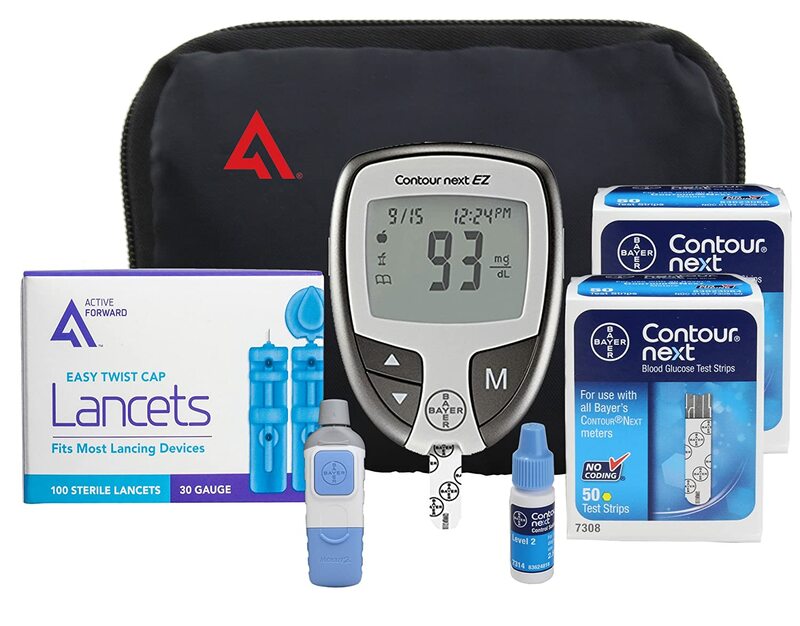 The Bayer Contour Next Complete Diabetes Testing Kit by Active 1st comes in two sizes. You can purchase the 50 strips version or the 100 strips kit. Each one will come to you with everything you will need when testing your own blood glucose levels. There is no worry about having to use all of the components quickly as each piece comes with an 18 to 28 month expiration date. This particular kit is packaged as an over the counter outlet exclusively. Best of all, the Bayer Contour has been rated as the world’s number one test strip for its accuracy and its quick results. The product dimensions on this glucose meter from Japan measure 5.5 by 3.2 by 3.2 inches with a shipping weight of 8.8 ounces. When you receive your kit, it will include the Next EZ Bayer Contour meter along with the Bayer Contour Next testing strips and the active 1st lancets. You’ll also find the lancing device and the control solution needed for testing. The control solution will help you achieve the most accurate readings. All of this will arrive in a handy carrying case with an instruction book included. It runs on one Lithium ion battery. Everything you will need for your glucose testing is included in the kit for one purchase price. The Bayer Contour Next can be used on both humans and animals. When it is used on a pet the lancing device’s level needs to be changed to a 5. This is because animals have a thicker skin then people. Therefore, a deeper penetration is required to draw blood. This particular glucose meter allows for plenty of storage when it comes to your readings. It can save up to 480 days’ readings, and as an added perk, it will do averages. The meter records each test with a time stamp. The average value is displayed in mg/dl, and it will also tell you the number of tests that have been performed. The test is used by sterilizing your finger tip with alcohol. A new lance is placed into the lancing device which is spring loaded. Next you will twist off the lance’s cap, close the meter, and then adjust the puncture depth. Once the device is placed on the finger, you only need to push the button to produce blood. The blood port on the test strip is touched to your blood and then loaded into the device to automatically begin testing. It should only take about five seconds to complete the reading. Online reviews highly rate this glucose meter by Active 1st. They like that all of the components are quality pieces, and the extended expiration date is greatly appreciated. Those who own this kit especially like how everything fits neatly into the zippered bag that comes with it. This makes it very convenient to take the kit along where ever you go. Results appear to be quite accurate. When people repeated the test immediately, the results were very close. Normal is 100, and repetitive testing only varied by about plus or minus eight. Users have found that the lances are small. This means less pain when testing. Most describe the Bayer Contour Next Kit as being the most accurate within this price range. Those who are familiar with diabetes testing praise the accurate readings stating that they often match the doctor’s test results. It is very simple to use, even for a first time tester. That combined with the travel bag makes it the ideal choice for first time glucose meter purchases. In addition, the strips don’t stick to one another the way they do with other brands of meters. The ACCU-CHEK Compact Plus is an all in one diabetes monitoring kit that allows you a convenient device to easily keep track of your blood glucose readings. Its lancet technology not only gives you a less painful way of testing, it has a lancet device that can be attached so that you can easily carry this system with you wherever you go. You’ll get your results fast with this device’s five second testing and automatic coding. In addition to the kit’s convenient all-in-one features you also get the 17 test drum which will remove the usual struggle people have with their test strips. 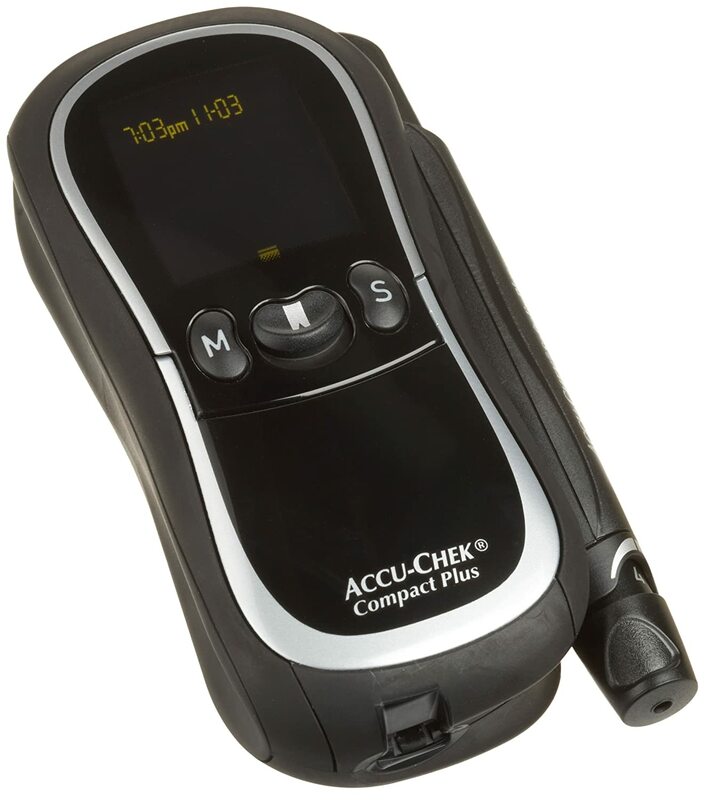 This ACCU-CHEK meter measures 5.8 by 3.1 by 8.9 inches with a shipping weight of one pound. That makes this system small enough to take along on your daily activities or while traveling. It is manufactured in Ireland, and test results can be downloaded to your personal computer. You will need to purchase the ACCU-CHEK 360° management system separately to take advantage of this feature. This makes it easy to either email your test results to your medical professionals or simply print out a copy to take with you on your next doctor visit. It has a 500 value memory with the ability to do seven, 14, or 30 day averages. When you purchase this meter you will be getting the lancet device and the actual meter as well as the preinstalled AAA batteries. You’ll also receive ten lancets, the control solution, a preloaded 17 test strip drum, and a nylon carrying case. All necessary instructions are included in an easy to read format with plenty of helpful pictures. The preloaded test strip drum used with this glucose meter allows you to easily dispense only one test strip at a time without having to touch the blood uptake or the electrode end. This also gives the test strips a longer shelf life than the average three months you get after opening a vial. This is an extremely beneficial feature to anyone with arthritis or other issues that limit the range of motion they have with their fingers. You simply press a button and the strip comes out. Online reviews show that most people find this testing meter to hurt less than similar devices at the same price point. The removable lancing device can be used separately or while attached to the meter. The lancet doesn’t wiggle which further decreases any pain associated with testing. The ACCU-CHECK Compact Plus works much like a ball point pen does. Everything is done by clicking. One click loads it, the next fires the lancet, and the last click ejects the needle. Reviewers find that the over-all size may be a bit larger than some models, but the fact that everything you need is contained in the one piece more than makes up for this flaw. It may take up more space, but with less gear to drag along, you’ll find it still feels quite compact when on the go. The size also allows for a bigger display screen that many people enjoy because it is easier to read. They have also found it to have a very long battery life. Another feature that gets high marks from those who have already purchased and used this glucose meter is the data plan. The software used with this model not only records and arranges your results in graphs and charts that are easy to understand, but it can help you when it is time to reorder your supplies. The TRUEResult Blood Glucose Starter Kit is ideal for point of care and self testing. The truetest strips that it uses are designed to be state of the art. They include quad-electrode laser accuracy for the best possible test results. Truefill’s innovative beveled tip will allow you to get better sampling precision while testing. This particular device has been proven to be clinically accurate with no coding. You’ll have your results in as little as four seconds with only a 0.5 microliter blood sample. This Glucose meter includes a data plan that will make tracking your test results both easy to read and simple to share with your health care providers. Its data management capabilities will store up to 500 results along with the date and time of the testing. It will also perform seven, 14 or 30 day averages for you. Additional features that make tracking you blood glucose levels easy include four test reminders, an audible fill detection, and a weekly display. This monitor allows you to use alternate test sites, and it has an automatic turn on and shut off feature. You’ll also find a Ketone test reminder and an easy to use strip release. When you purchase your TRUEResult Starter Kit you will be getting the TRUEResult meter with a three volt battery already installed. Also in the kit you will find 10 lancets, 10 test strips, and the glucose control solution in a 3 milliliter container. You will want to use this solution to perform a control test before you actually test yourself. A complete instruction booklet will help you get started, and the self testing log book provides a place to keep track of all of your test results in order to share this information with your doctor. This meter has a carrying case for those who have to test while on the go, and it comes with a lifetime warranty. It is made in Taiwan, and includes 100% satisfaction with your purchase. This is a basic blood glucose level monitor that only requires two steps to operate. You will simply insert the test strip and then apply a small blood sample. You will soon be given accurate results. This device needs to be stored in a dry place and be kept at a temperature of 36 to 86°F for proper functioning. The device itself measures five by five by five inches and weighs 10.4 ounces. It is manufactured in the United States. Many online reviews enjoy the fact that this is a basic system. Those who are not tech savvy find the fact that it doesn’t have to be used with a computer compatible data plan to be a plus. It is quite painless and straight forward to use. It is a favorite among caregivers who are responsible for their elderly parents. Due to its simplistic operation, both the patient and care giver can use it without any problems. Because this device uses such a small amount of blood for the actual testing, it is ideal for those who have to test frequently throughout the day. A glucose meter should be easy for you to use on your own. This is a device you will be turning to time and again throughout each day. You don’t want to add to this procedure by struggling with a hard to use meter. Some versions will require more effort than others. Consider how much of your blood is required for the test strip as well. Modern monitors that take advantage of the newest technology require a very small amount of blood for an accurate reading. You’ll also want to choose a model that displays the numbers on an easy to read screen. Factor in your time as well. Most tests only take a few seconds, so it doesn’t seem to be a deal breaker at first, but if you’re testing numerous times each day, those seconds can add up. Long term care requires you to track your numbers precisely. Your doctor will use this information to come up with the best possible treatment plan for you. Think about how much effort you are willing to put into this task before making a final decision on which meter to buy. Streamlined glucose meters are quite affordable, but they will only read your numbers. This requires you to physically write them down after each test. If you’re the type of person who is very busy and will find it hard to keep a journal of the results, you’ll want to find a meter that offers you memory options. Some devices will create a log that you can later retrieve to write down while advanced models will construct a file you can download to your computer where it can be emailed to your medical specialist. Not all features are beneficial to every individual when it comes to purchasing a glucose monitor. These features need to meet your own personal issues. Special features offered on glucose monitors can help you solve some common problems. If your glucose meter needs to go with you throughout your day, look for a compact version. Those who find these smaller devices hard to hold can select a larger model with easy to use strips. They are ideal for anyone with arthritis issues. Easy to read screens are available for people with vision impairments, and colorful meters are perfect for children. Backlit screens can be read comfortably at night, and there are also ones that are audio capable. Turn to the experts before purchasing your blood glucose meter. Your doctor or nurse is an excellent source of information when trying to choose the best glucose meter for your needs. They have experience handling a wide range of these devices and can guide you towards the most effective and user friendly models. You’ll also want to factor in which ones your insurance will cover. A less expensive meter your insurance will pay for may all of the sudden become more attractive to you if the pricier version will come directly out of your own pocket. Your insurance provider can give you a list of their pre-approved meters to help narrow down your options. Ask if and how they handle the cost of your supplies and testing strips too. There’s some costly glucose meters available on the market today as well as cheaper, budget friendly options. Your insurance may not cover pricier versions. Often the patient has to pay anything that exceeds their coverage. Once your initial investment in a meter is taken care of, you need to think about the ongoing cost of supplies. You’ll need test strips as well. These are sold separately from the device, and they too can become costly. Insurance companies that will pay for them often place a cap on how much they’ll spend per year. Find out this amount and calculate how much you will need to spend above and beyond that figure before making a final decision. When you are first told that you will now need to routinely test your blood glucose levels you may not know where to begin. There are so many different versions of glucose meters being offered that it is hard to know which one will be best for your own personal needs. If you want one that won’t be giving you any grief, try our gold pick. The Active 1st Bayer Contour Complete has it all. It is easy and less painful to use, will store your information for future reference, and comes with everything needed to do the testing. Another good option is the ACCU-CHEK Compact Plus Kit. This too offers quick and easy testing, computer compatible data storage, and is small enough to take along where ever you go. If you are still just looking for a basic meter that isn’t going to be complicated to use, try the TRUEResult Blood Glucose Starter Kit. This is our budget friendly choice for those who simply want a straight forward, simple way to test. All of these choices will give you accurate results in a short amount of time which allows you to keep a record of your blood glucose levels so that your health care provider can best help you with a treatment plan designed just for you.